The adoption of the Common Core State Standards has teachers and librarians on the lookout for quality nonfiction titles for students. Ocean Sunlight is one example of a narrative nonfiction title that is both engaging and informative. 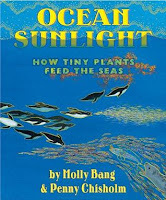 Author and illustrator, Molly Bangs, has partnered with MIT professor and scientist, Penny Chisholm, to create a nonfiction picture book about the importance of sunlight to plants and animals. Bangs and Chisholm worked together a few years ago on the nonfiction picture book, Living Sunlight. Chisolm is an expert on phytoplankton, and Ocean Light sheds light (excuse the pun) on how one-celled plants take in the sun's energy and pass it on to animals in the food chain. The book begins with an overview of photosynthesis before examining the ocean food chain. The authors point out to readers that unlike seaweed found near the shore, plants in the deepest parts of the ocean are not visible to the naked eye. "They're right before your eyes! in countless shapes and sizes. invisible pasture of the sea." The rich illustrations of ocean life complement the text nicely. On one page, penguins, sharks and a school of fish swim in the brilliant blue water while the bright sun shines down onto the water's surface. Illustrations of microscopic phytoplankton cover another page. The various geometric shapes and sizes will mesmerize young readers. When the focus turns to the very deepest parts of the ocean, the pages become black with the only light coming from phosphorescent creatures. Four pages of authors' notes in the back of the book provide readers with more information about ocean food chains, photosynthesis, marine snow, and a variety of related topics. 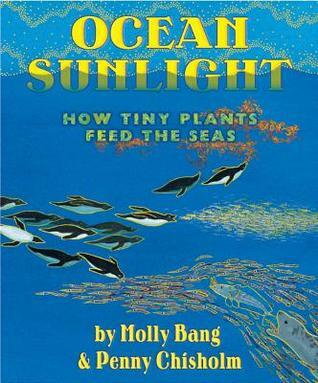 Ocean Sunlight would serve as an excellent resource for science units on photosynthesis, food chains, or ocean life. It may be most effective as a read aloud so that teachers and librarians may discuss new concepts with students.